Whew! Time is flying by. The first draft of the post was written when I was feeling worn down by the news, but a great weekend has boosted my spirits! Today I’m here to share a dress I finished back in January. A beautiful reminder of our fantastic family vacation to San Jose for Thanksgiving. At this point my winter wardrobe is in pretty good shape. 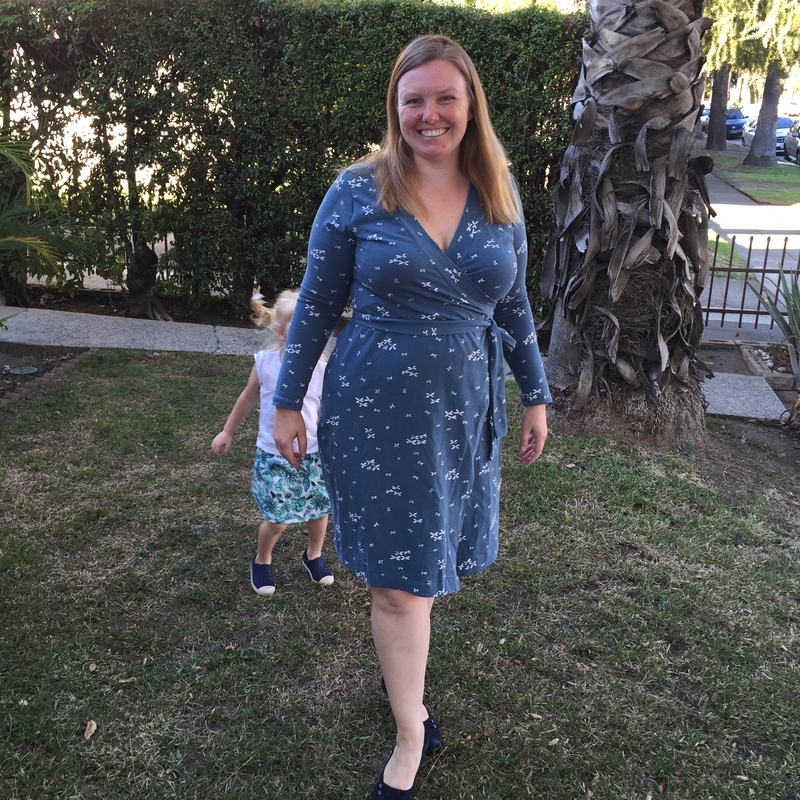 I have several skater style dresses, some more casual knit dresses, a couple of skirts/sweater sets, and a couple of wrap dresses. That’s enough to see me through our short and mild cold season. But I couldn’t help squeaking in one more Appleton Dress before spring arrives. I love this dress so very much. 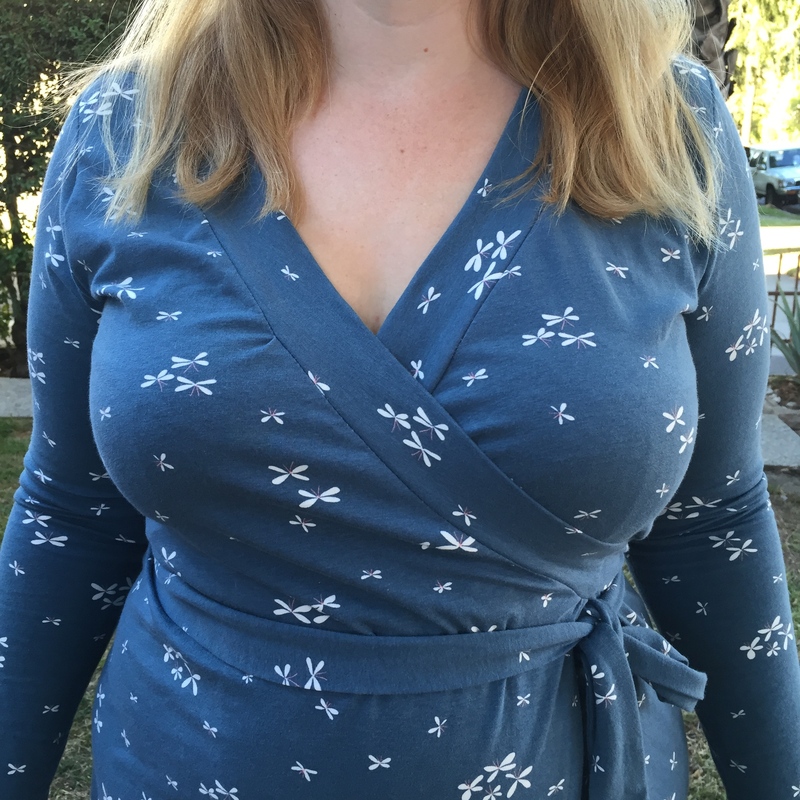 After trying 4 different fabrics with the Appleton pattern rayon is hands down my favorite. It just has such great fluidity and drape. It is so smoooooooooth. I also love the way it feels against my skin. That said I was picky about the rayon I choose. I made sure it was a decent weight so it wouldn’t be too sheer. Also went with a dark color. Rayon will show every wrinkle and seam in your undergarments. The deep plum color helps mask those issues. This version also has a lot of vertical stretch so everything falls a little longer than my other versions. I don’t mind, but it did put the hip shaping lower than I anticipated. Oh well, it is very minor and doesn’t detract from the overall look. I purchased this fabric at Britex in San Francisco while my husband and I were on a rare childless outing. Here it is modeled with my new spectator pumps. Such a fun outfit to wear to work and shake away those winter doldrums. And now back to the work week, but lots of fun stuff coming up in the next few weeks! I squeaked out one more dress for 2016! I really didn’t think I had the time, but the fabric was washed, the pattern was something I’d made before, and I had a couple free evenings! Plus my birthday was falling in a pocket of cooler than typical weather. This is Cashermette’s Appleton pattern in some gorgeous green merino wool jersey from The Fabric Store. I’d purchased the yardage last December on my first visit to the Los Angeles location, but then I started to doubt my ability to sew with it! I’m glad I waited. This past year I have learned a lot about sewing knits on my Janome. It doesn’t have the lightening bolt stitch so I’ve had to repair many of my dresses as the various test stitches have popped with wear. This jersey is so fragile that I don’t think the seams would hold up to the wrong stitch. As I’ve mentioned before I now use something like baseball stitch and it work really really well. Then I use a faux coverstitch for the hems. I own a serger, but I enjoy sewing on my regular machine. I also don’t have a dedicated sewing space, so it is frankly easier to have one machine out all the time than swap them out with every project. The finished dress is a breeze to wear. Since my birthday is so close to Christmas this dress will do double duty for both events and keeps me nice and warm as well. The only negative thing about it is the fabric is sheer in photos taken with flash. So I’ll be sure to wear some good undergarments! Happy New Year! Yay for 2016! Here in Pasadena the Rose Parade has marched down Colorado Blvd. and the Rose Bowl game has been played. Time for our little city to calm down and start getting ready to return to our regular routine. I managed to eek out a little more fabric and sewing fun during our holiday break. On New Year’s Eve we took a family outing to see some friends on the other side of town. On the way back my husband wrangled our overtired kids so I could make a stop at The Fabric Store! I’ve been eyeing their merino jerseys for a while, but it isn’t easy to make it cross town with two small children. I was so glad to finally stop by and I wasn’t disappointed. I bought two lengths of jersey to make wrap dresses. One is emerald green and the other is sort of a soft mauve color. Wool might seem a little silly in our climate, but I wear wool nearly every single day. It is so breathable! Plus both fabrics are fairly lightweight with a nice drape. 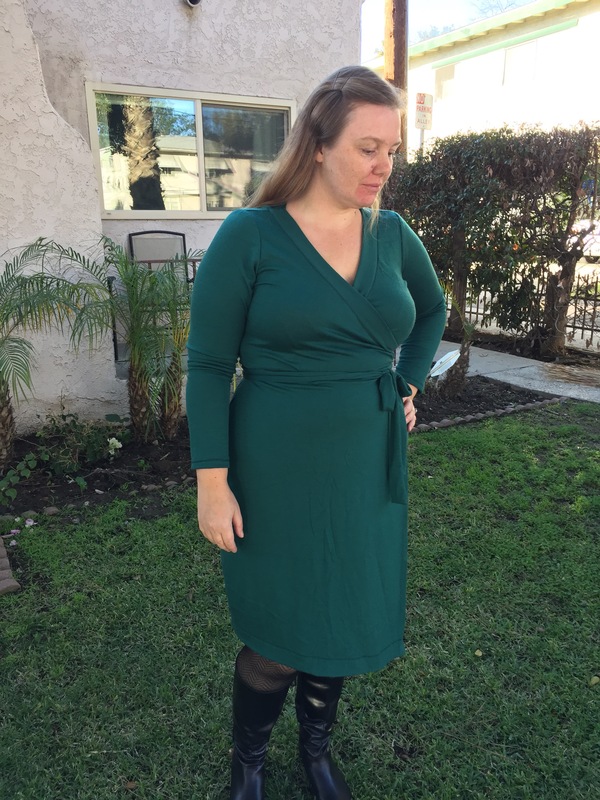 And wrap dresses are so great for work wear and flattering as well. And as if friend time and fabric shopping wasn’t enough, I also wore my new Appleton Dress for the whole day to see how my fit adjustments would work out. And the answer is…nearly perfectly. This version is made with one of the kits Jenny sold when the pattern was first released. I held onto the fabric because I was nervous about sewing with a rayon blend. But now that I’ve worn my two Appletons many times I had a much better idea how they fit and what changes I wanted to make. The biggest change I made was to lower the waist by one inch. This was tricky because there are no markings on the pattern to do this sort of alteration. So I ended up finding a nice small point between darts to add the length. Thankfully it worked! I cut both fronts the same so I’d have more overlap. 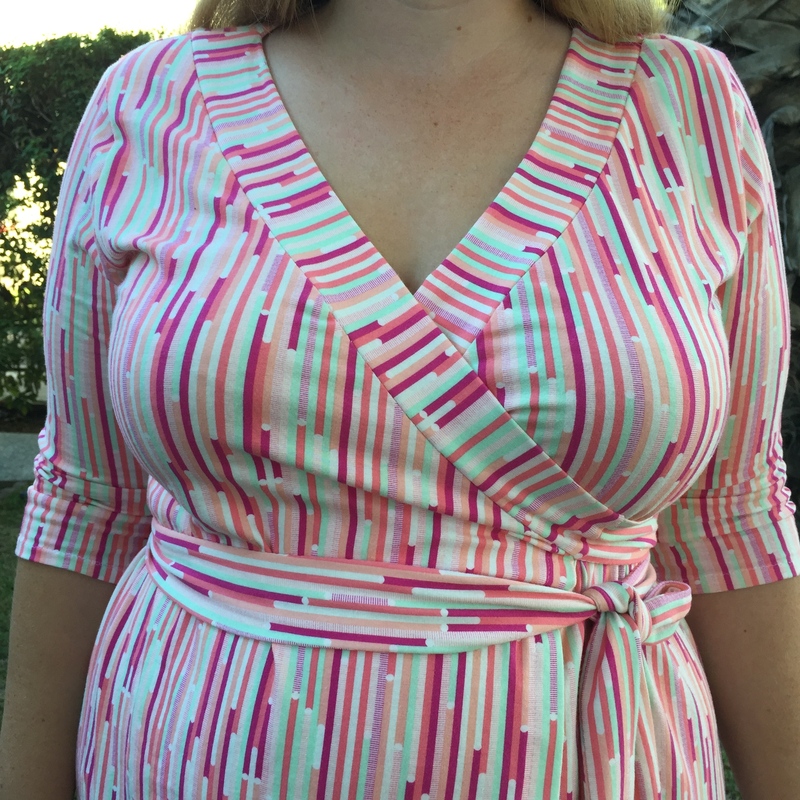 Then I cute the neckline trim pieces a little longer to account for the extra length. That was the only fail. The neckline needed to be a tad bit more snug. Lastly I took some of the fullness out of the front armhole and now the front lies so smoothly. Perfection. This dress will fit perfectly into my work wardrobe and I am so happy to leave 2015 with a bang! I cannot wait to keep tweaking and hacking patterns in 2016 so I can have a whole me-made wardrobe of custom fit clothes. Having a good fit really make me feel a lot more confident about myself. It’s super exciting. And this time Dottie got in on my photo shoot. Silly dog! Some people love the process of making things. They make sure each step is perfect before moving forward. Maybe they take good notes. I’m not that kind of sewer. I like getting to the finished product. But I’ve been working on tweaking the fit of my clothes because finished projects aren’t worth much if they are badly fitting. Moving forward I’m going to strive to take more time on the process of sewing, but for right now I’m in alterations land. 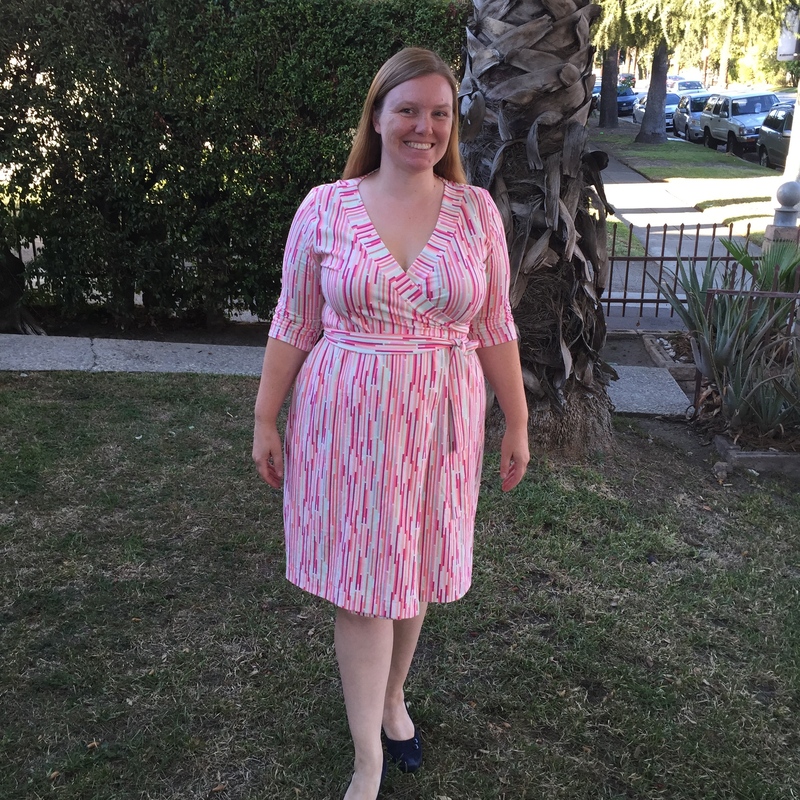 For example, here is my Appleton Dress right after I finished it. See those folds above the bust? Well I contacted Jenny (the pattern designer) for her feedback and she mentioned something called a concave chest alteration. It can come from poor posture or a large and lower bust. That I certainly have even in a well fitted bra. So armed with a name for the alteration needed I hit the internet and found this fantastic guide from Sew News. Ta-da! They have something you can do to fix an already finished garment! 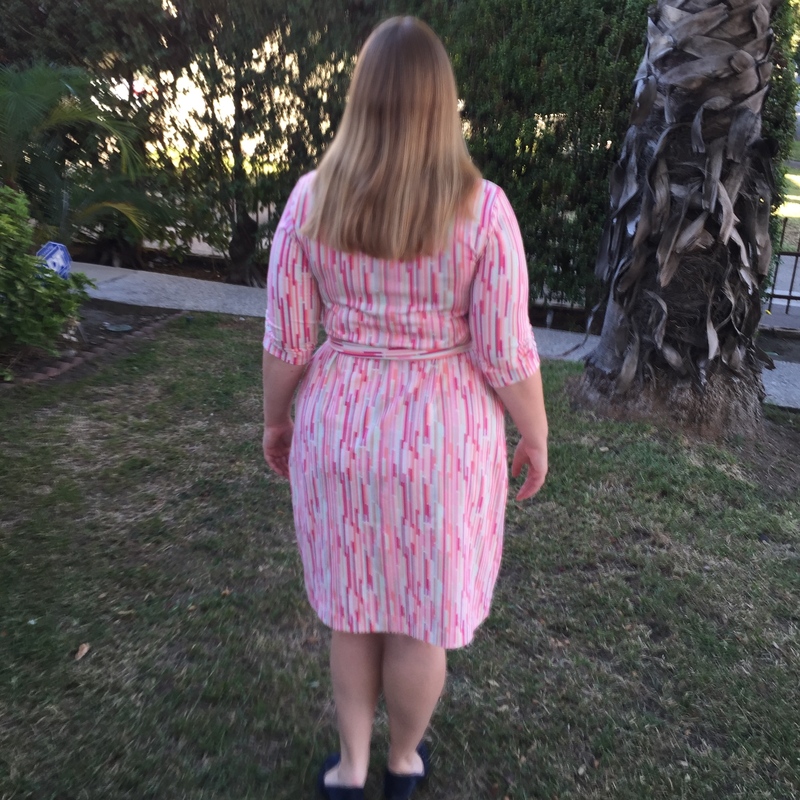 So I altered my Appleton Dress and while the fit is not as good with an after though fix, the results look much better! 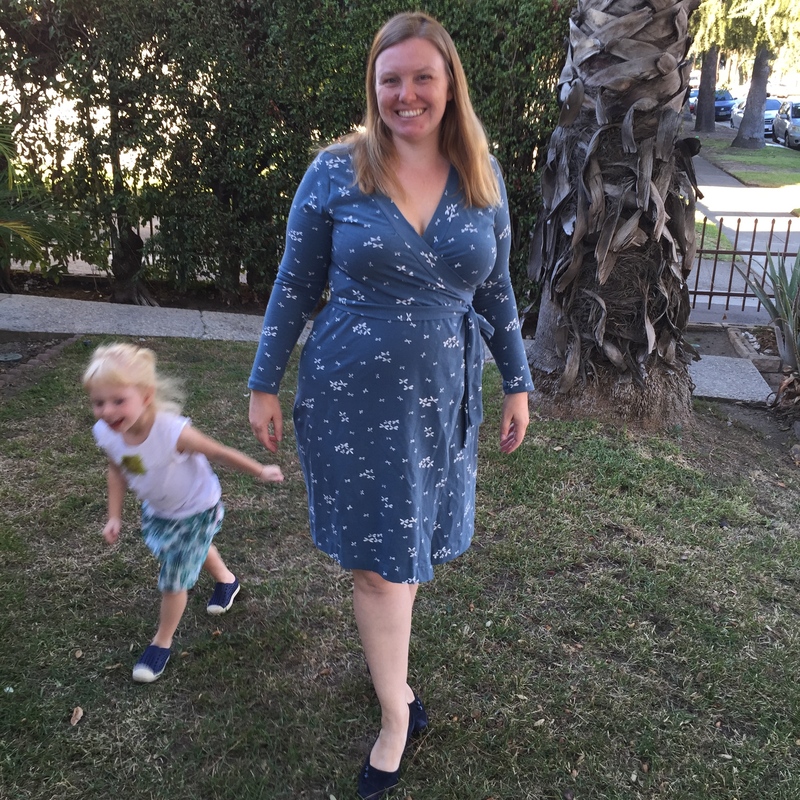 Next I tackled the Emery Dress that gave me such grief. I ended up taking in the back all the way from neckline to waist by 1/2 inch and also re-did the zipper to take it in further. And the top of the zipper is still funky, but the rest of the fit is much much improved. Just look at how much more smoothly the fabric flows! Next I really need to make a muslin of the Emery dress so I can tune in the fit on a fabric without such a heavy pattern. And doing all these alterations reminds me how much I should make a new block. I’ve gotten comfortable with manipulating patterns and making up my own that it seem silly to so heavily alter someone else’s pattern. But on the other hand sometimes you don’t want to re-invent the wheel. So we’ll see. Right now I am deep into making an 1899 winter dress. I need to be done by Thursday. Hopefully I make it! I know I will. All I have left to do is re-work my under garments and decorate the outer garments, but it is fussy work. I’ve gone a tad bit nuts this week making new dresses for myself. The high temperature never topped 75F all week and now that the time has changed most of the time I am outside is in the early morning or after dark. I suddenly found myself wearing sundresses and cold. Plus I got a new pattern in the mail right before the Halloween madness and I really really wanted to give it a go! 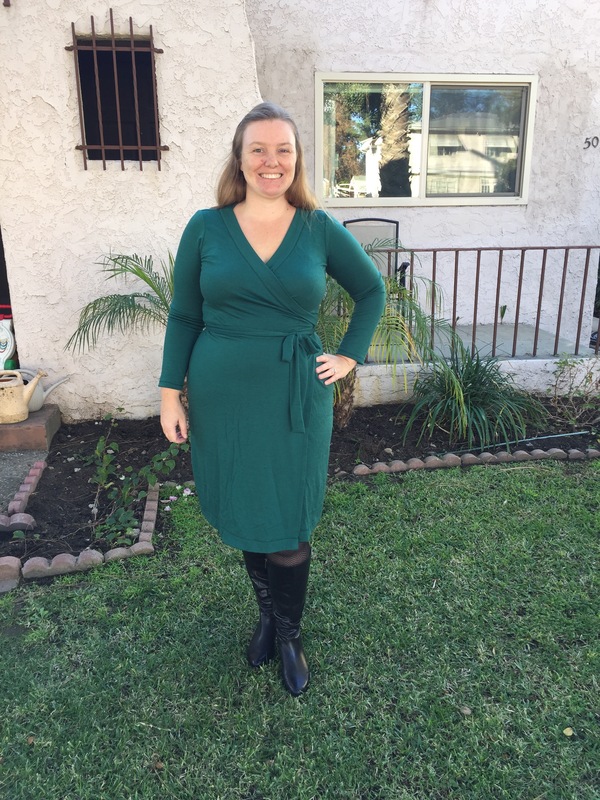 This week I worked up two versions of the Appleton Dress from Cashmerette! At first I wasn’t quite sold on the pattern, but then I read it came with 3 different bust ranges and a sway back adjustment built in! Sold! I bought one of the kits she had for purchase, but I’m a little nervous to cut into the rayon jersey. So I turned to some Art Gallery jersey I’d bought but didn’t particularly love. It was not quite the color I’d expected so it has been sitting unloved. Then the other night I decided to go for it! Usually I don’t drink any alcohol on weeknights, but I’d really wanted a glass of wine. Bad idea. Between the wine consumption and the preschooler interrupting me with a request to shoo away a monster in her closet you could say I was distracted. And cut a straight size 14 E/F. I also cut two right sleeves and the front pieces backwards. Whoops! It’s actually not near as bad as I thought it was when I first finished it! Wearable though a little tighter than I’d like. The fronts don’t cross over by that much and I’m interested to see if it becomes indecent at work. The sleeves are also tighter than I’d like. I wrote into Jenny to ask about sleeve ease and she very quickly replied that her testers found it okay. Thank you Jenny! But it was still too tight for my taste. Anyways, I took a peak at my other jerseys and picked another print that had left me stumped. Its a stripe and I figure using them running vertically would be flattering. I was right. Here is version #2 a size 14 G/H top, 16 waist, and 18 hip with size 16 sleeves. My husband said I looked like a piece of candy. Yummy. And yes! This version looks awesome, though I probably didn’t need to go to the 18 hip. Next time I’ll just grade to the 16. And I totally love how the strips work to frame the neckline and waist. Fantastic! The sleeves are a lot better fit too and not hard at all to sew into the slightly smaller opening. But, what about the bust? Did I need to go up to the G/H size? I probably didn’t need to, but I did have to tug a bit to get the blue dress to sit right. 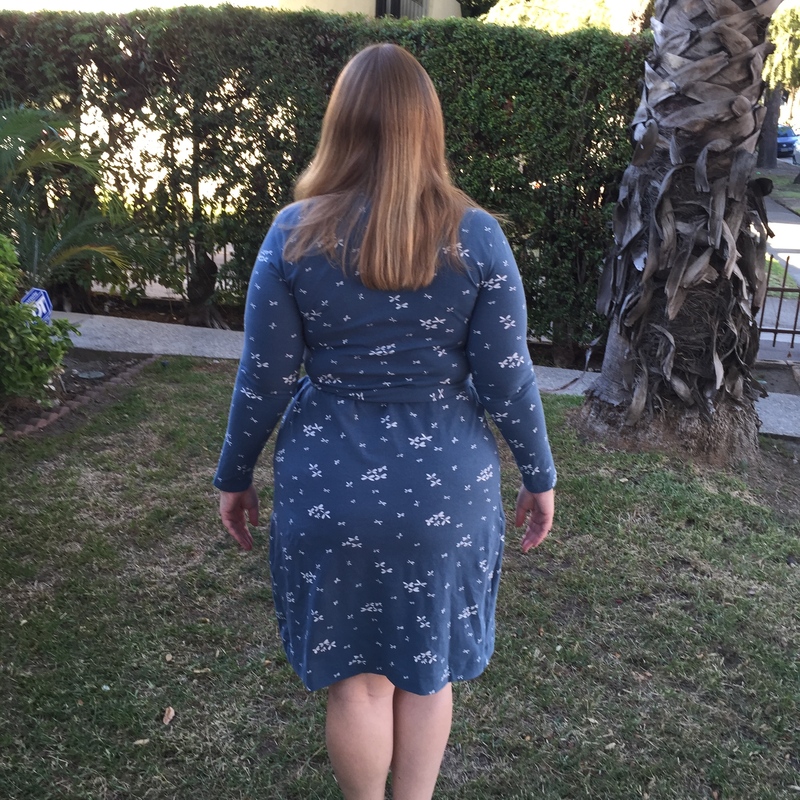 Jenny’s claim is a no budge neckline, but it did slip a on both versions. Anyone have any fit tips or opinions? And I’m on a roll churning out dresses and have two more coming soon! So I’ll leave you with a Lu photo bomb. This kid is wonderfully crazy.